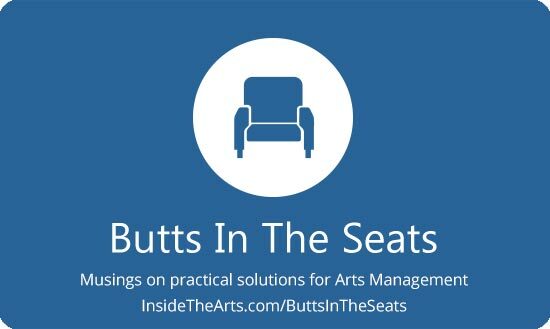 Thanks to Drew McManus for remembering that Butts In The Seats turned 15 this weekend. Hard to believe I have been writing for 15 years now. Hopefully readers have found the content worthwhile. Over on ArtsHacker today, I had a post on a very worthwhile subject– Unrelated Business Taxable Income. I know, you are fighting to keep your brain from shutting down right now. What that translates to for non-profit arts organizations is, among other things, any advertising you may have in publications, playbills, social media and web posts, etc., is considered an activity unrelated to your organizational purpose which means you need to pay taxes on it. Now before you panic too much, placement of sponsors logos and contact information is permitted within the scope of your non-profit status. While advertising versus sponsorship may sound like a distinction without a difference, there are strict guidelines you need to follow. There can’t be comparative or qualitative language, no pricing, no inducements/endorsements to use/purchase a product/service. If this sounds like something you have run into trying to promote an event on a public radio station, that is exactly what it is. At one time I thought it was a characteristic of public broadcasting charters so they didn’t compete with commercial broadcasting. In fact it is a characteristic of non-profit status so it also includes school yearbooks, neighborhood sports leagues, community newsletters, etc. The post I made isn’t a comprehensive discussion of the matter. I didn’t even try to tackle the recent change that made providing employee parking something non-profits need to pay taxes on. It is a good place to start before following up with an accountant or attorney. On a semi-related topic, I also made a post about the detail to which a non-profit needs to go when valuing and acknowledging a gift from a donor. Even if you think you know a lot about this subject, it is worth checking about because money from donor advised funds are viewed differently than those received directly from the donor. Given the growing popularity of donor advised funds, there are likely things you will want to learn more about from an accountant or lawyer. About three years ago I wrote about the problem of ticket resellers creating website names that approximate that of performance venues or using names that imply they are the central ticketing source for your city. At the time, my venue saw people who had bought tickets at a big mark up or for events that weren’t actually happening once a year or so. Now that I have moved to new position in a new city, I see it happening ALL THE TIME. Perhaps one of the reasons this issue is coming to light regularly is that we changed our seating configuration about two years ago resulting in the removal of two rows and various individual seats. The resellers are selling people tickets to those non-existent seats so the problems is very evident very quickly. I just attended a meeting of colleagues around the state and many of them are reporting similar issues with ticket resellers. Right around Christmas this year, we had a show cancel and in the process of issuing refunds, we had to tell a gentleman that we couldn’t process a refund to his credit card because it wasn’t the card that purchased the tickets–it was the ticket resller’s. He was irate to say the least, especially since he paid about triple the actual cost of the tickets. He demanded we call the company and tell them the show was cancelled since he felt, perhaps correctly, that they wouldn’t believe him. Much to my surprise, after waiting on hold for quite some time, I was able to get the company to process a refund for him. We include a warning in all our email newsletters encouraging people to only purchase from us–but that only reaches people who have already successfully purchased tickets from us, not those wishing to attend for the first time. If you are running into this, there are a couple things you can do. First is to do an online search using various terms like “tickets venuename theater yourtown,” varying the order and removing your venue name and only using generic terms like theater, dance, music. See what sites come up and see what they are selling your tickets for. Contacting them to tell them to stop probably won’t work, but at least you will be aware of what customers might be seeing. I don’t know if Google is doing a better job fighting SEO attempts by these sites, but when I ran a search before writing this post, there were far fewer reseller sites appearing as results before my venue or even on the first page than there were in December. However, the one that did come up before us is offering tickets in rows that no longer exist to a show that sold out in October. Something we have done is worked with our ticket vendor to disallow credit card sales from out of state ZIP codes. We are smack in the middle of a state so it isn’t a big deal. Even if you are on a border, you may be able to do this for a significant geographic region across borders. Most ticket reseller purchases we have encountered are from the West Coast or Mountain West. Be aware though that resellers get around this by using Visa/MasterCard branded gift cards which don’t require ZIP codes. Another thing to watch out for is people posting on your Facebook events page saying they bought tickets but can’t make the show, encouraging people to send them a direct message and they will sell them cheaply. Generally what these people, as well as many of the reseller sites will do, is place an order with you after people have contacted them about their “extra tickets.” I would encourage you to delete these messages when you come across them. One of the big giveaways is that the Facebook account has been created in the last couple months and the person doesn’t live anywhere near you. They probably won’t have a record of purchasing tickets from you either. They may populate their page with pictures and friends connections to add some verisimilitude, but if you look carefully there are some clues. Today we had a guy offering tickets for an event tonight that was born in Canada, apparently lives 300 miles or so away from us in Florida and is the CEO of a company in Poland. I am sure there are much more sophisticated techniques other groups are using on larger venues where the return on investment makes it worth it, but I figure this will provide people with a general sense of what to watch out for. Anyone got any stories or tips they want to share?